Home >> May 2010 Edition >> Upgrading To "Military Grade"
Advanced Extremely High Frequency System, image courtesy of Air Force Space Command Military and civilian agencies alike depend on advanced satellite services to communicate between forward deployed personnel and command centers outside the area of operations. These communications solutions enhance intelligence gathering and in-field decision making, often creating a competitive advantage in an otherwise hostile environment. The type of information exchange can range from a simple phone call, to something more complex like an encrypted live video feed from an Unmanned Aerial Vehicle (UAV). Either way, its a communications channel that must be up and running at all times. The challenge for many military and government agencies is obtaining access to high reliability reach back communications in a timely and cost effective manner. 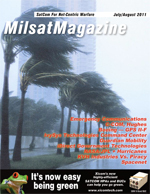 With federal budget cuts, many traditional MILSATCOM programs are either under pressure or have been disbanded altogether. The now cancelled Transformational Communications Satellite System (TSAT) was a $26 billion Air Force program designed to significantly expand government access to broadband satellite communications. With the programs demise last year, U.S. forces must now compete for access to the only other modern large scale broadband military satellite fleet  the Wideband Global Satellite (WGS) program. Despite its technological advances and unique military frequency X- and Ka-band satellites, the three spacecrafts of the WGS fleet simply cant meet the demand for bandwidth-hungry battlefield applications. Obtaining mission priority for MILSATCOM resources can prove difficult, especially for quick deploy units or logistics support missions. Even when capacity is available, it may take days or even weeks to procure and initiate service on WGS. For special forces, emergency response teams and other fast moving government units, that process may not support critical mission timelines. In fact, the U.S. Space and Missile Defense Command (SMDC) estimates that military owned and operated spacecraft will only be able to support between 10 and 20 percent of all government satellite bandwidth requirements through the year 2016. As a result, the government must rely on commercially operated satellite services to provide the bulk of its voice, video, and data communications traffic . This dependence on commercial satellite service providers creates a dilemma. Military and government requirements for network security are understandably much higher and more complicated than for traditional commercial customers. The U.S. government is increasingly raising the bar on standards for Information Assurance (IA) and overall network security. Meeting these standards often requires investments far in excess of traditional commercial teleport capabilities. There are, however, a handful of qualified service providers who are making the investment in their infrastructures to support growing government demand. These companies are broadening their product portfolios to offer near military-grade services from traditionally commercial sales channels. This evolution starts by adopting new technologies and implementing a whole host of government standards, such as Transmission Security (TRANSEC) and Federal Information Procession Standard (FIPS) 140-2. By upgrading the physical and network security capabilities of their facilities with features such as active intrusion detection, many commercial satellite service providers are able to achieve Mission Assurance Category certifications at various levels. Perhaps more important is the focus on developing managed services that offer true military-grade features and options, along with the ease of a commercially available off-the-shelf service. By combining these military-grade features into a commercially available managed service offering, the government customer gets the best of both worlds. Just to be clear these services are not MILSATCOM. They remain commercial services, but they come with many government-specific features, functionality, and options that field deployed personnel and mission compliance officers demand. Commercially available military-grade satellite communications services can provide an excellent augmentation to traditional MILSATCOM. These services enable the immediate redeployment of WGS field terminals on an X-band or Ka-band commercial network, even when military space segment is simply unavailable. These virtual network operators often face serious quality control issues due to the hands-off approach and lack of visibility into the daily operations of the network. Virtual network operators generally cannot implement the latest bandwidth optimization tools because they dont own or control the infrastructure. Many lack the in-house expertise to configure or manage sophisticated remote terminal equipment, like maritime or COTM antennas. And as virtual operators are often several layers removed from the actual network, they are challenged to provide consistent levels of responsive customer service. Overcoming these challenges requires only that the government customer select an end-to end satellite service provider who has invested in the facilities, infrastructure and security measures necessary to ensure mission success. By partnering with a systems integrator that owns and operates the network service (including multiple 24x7 teleports, network operations centers, in-theatre support centers, a global terrestrial backbone, and cleared in-field personnel), a military or civilian agency can ensure better command, control and communications support for its missions. Ease of deployment and support are some of the primary reasons that government agencies and the military are starting to look to end-to-end service providers to help meet their mission requirements. At the end of the day, the providers that can offer the quickest delivery, installation and support times, while also enabling customization and flexibility in hardware offerings and capabilities, will represent the best customer value. The recent announcement by the Defense Information Systems Agency (DISA) and the General Services Administration (GSA) to realign satellite equipment and service procurement under the new Future Commercial Satcom Acquisition program, promises to make procurement easier as well. Fully managed military-grade commercial satellite services will be available off of the GSA Schedule 70 contract. Government agencies will be able to purchase pre-packaged or customized communications solutions of equipment and services off of standardized rate cards. Maintaining real-time communications access to the chain of command is a truly mission-critical requirement for todays NETCENTRIC forces. With the new military-grade commercial satellite communications services, government customers will no longer have to compromise between military features and functionality, and commercial availability and ease of procurement.